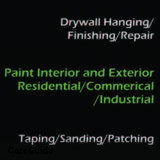 Reliable and Professional Painter, Interior & Exterior, Immediate availability-Flexible Hours. * Interior & Exterior, ceiling, walls, doors, baseboards, windows, decks. * Taping , mudding , sanding . *Experienced for about 10 years.